Back-Up Story: "History of the Multiverse - Chapter Eleven"
Karate Kid and Una are on their way to see Oracle. Oracle tries to keep them out and tells them she wants to be left alone. Meanwhile, in Gotham, Piper and Trickster hide out in Penguin's wine cellar. Pengy comes up from the wine cellar and tells the waiting Suicide Squad (Deadshot, Plastique, Bronze Tiger, and Boomerang) that Piper and Trickster are all theirs - but mind the wine bottles. In sub quantum space, Jason Todd, Donna Troy, Bob the Monitor, and Ryan (Atom) Choi continue to search for Ray Palmer. They travel to a topsy-turvy magical realm. It appears they are being watched in the shadows by beings with glowing red eyes. In Metropolis, Jimmy Olsen stops a mugger as Mr. Action. The female victim thanks him with a kiss. Jimmy considers his next move - he should join a team, but which one? He decides to seek out the Teen Titans. Jimmy's so focused on his own thoughts that the mugger slips away. Back in Gotham, Piper and Trickster come running up into Penguin's Iceberg Lounge from the wine cellar with the Suicide Squad in hot pursuit. Piper and Trickster get too far from one another and the electric chain that binds them together goes off. Trickster is unconscious and Piper has to carry him. Penguin shoots umbrella gas into Plastique's face, telling her that his lounge is an explosion-free establishment. He tells Deadshot he's on his own side. Trickster and Piper appear to get away. In Metropolis, Holly gets Harley to get her in to see Athena. Holly asks Athena why they turn away women with children who need help. Athena says it's beyond their scope, that they're about reaching out to women who need strong role models to mold them to a better way of life. Athena says she's organizing a self-esteem workshop and wants Holly to attend. Holly agrees. Oracle tells KK and Una she knows who they are but hasn't got the time for them right now. KK says they're not going anywhere. He rips off Oracle's restraints and they head into Oracle's lair. Oracle tells them she is too busy trying to prevent the secret identities and home addresses of every super hero in the world from being stolen. Piper blows his pipe which makes them appear invisible. They think they're safe. But they're confronted by the new Question and Batwoman. The Monitors continue to argue about whether it makes sense to kill people who cross over from one Earth to another. They explain that each of the 52 universes are kept apart by a source wall that surrounds each of them and that the space between source walls is anti-life. The Bleed occasionally appears within the anti-life and allows for "quick and easy" transport between universes. The Monitors are in a Nexus, a unique adjunct to the timestream that exists everywhere at once. They can see everything that takes place - except that which occurs in the Bleed. The Monitors can use Forerunner to end Multiverse travel. They can also use their "shadow demons" which are anti-life manifestations capable of wiping out whole worlds. 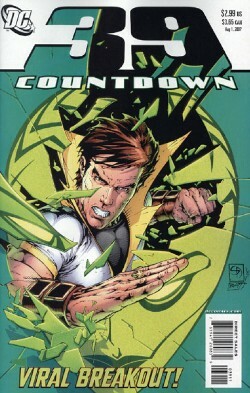 Main Story - 2: Call me cynical, but, to me, this week's Countdown appears to be about making sure fans continue to read "Birds of Prey" now that Gail Simone is no longer writing the book. Holy homosexuality! June may be gay pride month on Earth Prime but, on New Earth, gay pride appears to be in August. There are four main characters with a homosexual orientation this issue - Pied Piper, Holly Robinson, the Question, and Batwoman. Being a gay man, I'm certainly not complaining, but it does feel a little contrived to have such a gay-heavy issue with the reintroduction of the media-frenzied gay Batwoman. Then again, I did admit earlier in this review to perhaps being a bit of a cynic this time out. Finally, I'm not jazzing on Jimmy Olsen's storyline that much anymore. Jimmy in costume and trying to join a team isn't nearly as interesting as Jimmy in conflict trying to figure out where these powers came from. I prefer to see Jimmy as the everyman looking for how he fits in a new Earth order rather than as just another costumed hero - particularly one whose color scheme and mask looks so much like another featured hero in Countdown - The Atom (both Ryan Choi and the one his allies are searching for, Ray Palmer). And the victim kissing the hero feels totally lifted from a very similar moment in 1995 film "Batman Forever". I fear writer Paul Dini may be undoing all of the geek goodwill he earned as one of the principal creators behind "Batman: The Animated Series" and "Superman: The Animated Series". Main Art - 3: The interior art feels a little rushed except for the two artistic highlights of the issue - the Legionnaires entering Oracle's sanctum, and the return of Batwoman. It's as if the artist put all his effort into those two renderings to the exclusion of the same effort on the rest of the issue. Back-up Story - 2: This really ought to be called "History of the Multiverses" - it covered the original Multiverse and now it's covering the rules of this new one. Though in typical DC fashion, the Monitors only share part of the story. It's a total cop-out for the Monitor to say that, while each Earth has a Monitor, some of the Earths are shrouded in mystery. Shrouded in mystery to the Monitors? Surely not based on their own rules laid out in this story - that they can see all. It's just the fans who are in the dark. Again. Back-up Art - 4: Jurgens is doing a nice job with the art in this back-up series. And I like seeing him paired with Jerry Ordway. It's too bad the story isn't as strong as the art. Cover Art - 4: It's not a particularly interesting or novel cover - we've seen characters use the cover as a way to break through the book before. But I like it anyway. I wonder who does Karate Kid's highlights.